On Saturday 25th August, John, our Chairman is running his miniature engine from Bideford Station (https://en-gb.facebook.com/bidefordrailway.co.uk/) to Torrington station (http://www.tarkavalleyrailway.co.uk/) along the Tarka trail and then back again. 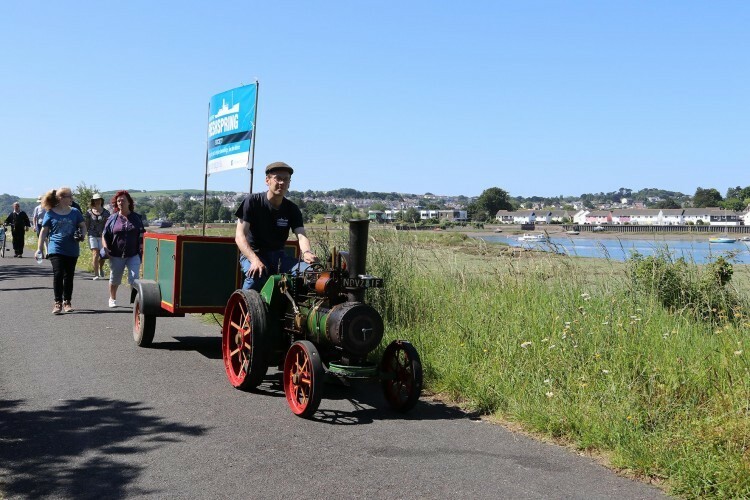 There is lunch available at the Puffing Billy, Torrington (https://en-gb.facebook.com/PuffingBillyTradingCo/) and the Mayor of Bideford is riding all the way. The event is to promote both railway groups, to bring them together and to support the relaying of the railway between Torrington and Bideford. It will also promote Freshspring as we are delivering Freshspring beer to the Puffing Billy and generally the Tarka trail. This will be the first steam on the route since 1965. It is hoped that as many people as possible, including families will become involved in the event by joining us and walking, on cycles, with prams or anything else person or electrically propelled. Please come along to support the day. It will keep you fit and be fun.